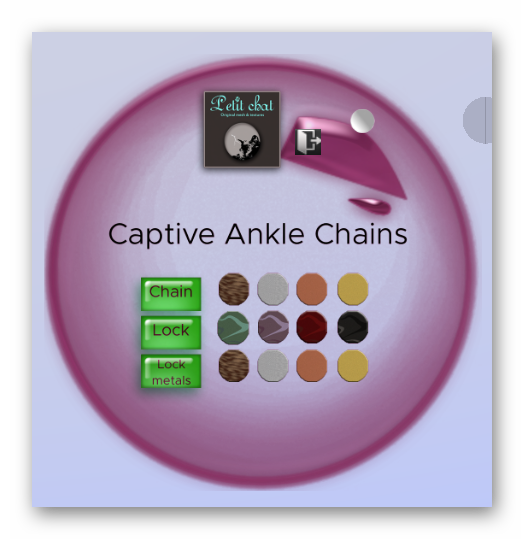 The Captive Ankle Chain from Petit Chat is a nice pair of chains you can add to your outfit easily and it comes with several customization using the included HUD. The 3 components on the chain can be easily made to match whatever shoes you have using the easy to use HUD. Kitty has customized one which goes really well with her shoes. Notice the little cute lock on the chain, that is precisely the theme with "Captive".